The Grown-Ups are Lying: Clean cup, clean cup. Move down. Clean cup, clean cup. Move down. 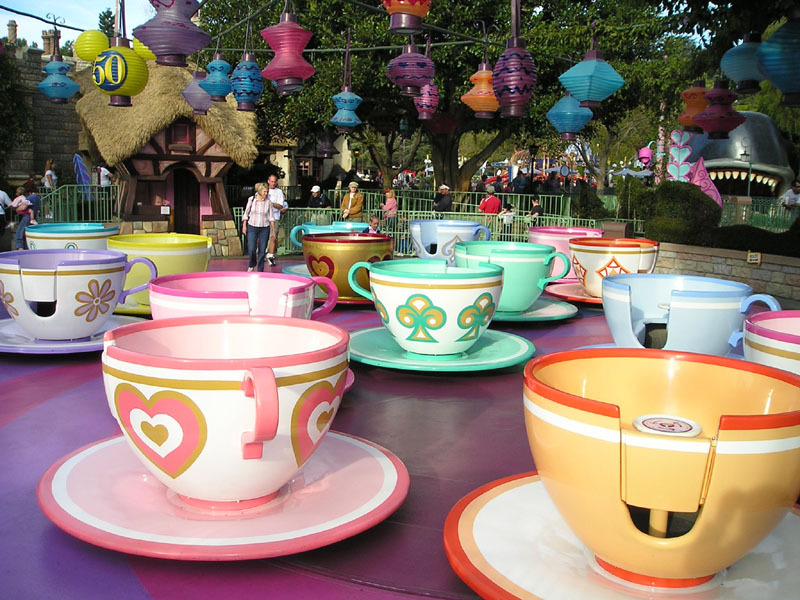 Walmart has flower pots shaped like giant teacups. Walmart has flower pots shaped like giant teacups. 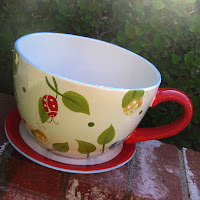 This is exciting because 1) I love teacups, and 2) I love things in sizes that they are not usually in. So of course I bought one. It's obviously a ridiculous thing to buy, so I almost didn't... but then I did. 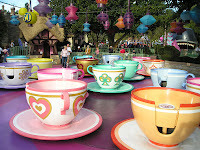 Because, when you have the opportunity to turn a large-sized teacup into a small-sized Disneyland teacup, you do it. So I did, and so should you. 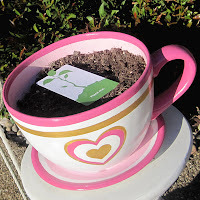 This project is fairly simple, if not a little time-consuming. I just did a little bit at a time, over several days, since there's a lot of waiting for paint to dry between coats. With all the coats you have to do, trying to do this in one day, I imagine, would be very frustrating. Also, being that it's fairly easy to copy, I'll try to keep the steps brief. 1) Spray your base coat in several thin layers, letting the layers dry in between coats. If you try and do one thick layer, you will have drips of paint all over the thing. I did four layers. 2) If your inside is a different color than your outside, paint the inside. If not, skip this step. 3) Paint the saucer, the rim of the cup, and handle. There are a few ways to get straight (well, circular) lines around your cup: to draw lines on the saucer, I used a compass (first picture); to draw the line around the inside rim, I used a compass a slightly different way (fourth picture); to get a nice, crisp line around the outside rim, I made pencil marks 1/2" from the top, and used those to guide painter's tape around the outside (second and third picture). I did between two and five coats on these parts. 4) Tape off (or use the compass to draw guidelines) the second line around your cup and paint it. 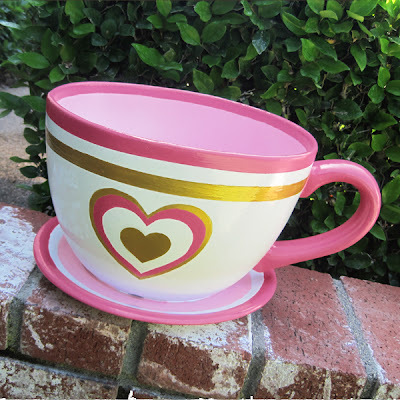 Be careful with metallic paint--it tends to dry rubbery, and can peel off easily. In fact, I might recommend you draw lines with the compass, rather than tape it off; I had some difficulty with the tape. I did five coats here. 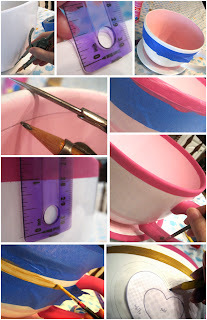 5) Trace on your pattern and paint it. You can use my stencil if you'd like, or create your own. I just printed it on regular paper, and cut off each heart after I traced it. 6) After it's completely dry, spray it with some kind of glossy outdoor-appropriate sealer. One coat should be fine; I did two just to be safe. When it's dry, it's done! After mine was all dry and done, I planted some junk mail from Google in it. Yup. I'm excited.